Let me make some suggestions. Load this an look at the color of the light. There will be new light appearing. The shadows will become interesting. The area around the rabbit is special. How to bring that out? The end of the street is a problem and that can be overcome by retouching? How would you deal with that? This is a challenging picture and I believe has magic in it. Can you bring it alive? I see that you're starting to see the light! As Asher pointed out, it's the light in this photo that makes it special, and the hare just adds that extra touch. The question is this: what's special about it to you? What would you like to do to this image? Once you know where you want to take it, we'll be able to help you get there. I used Photoshop's Shadow/Highlight command to bring out the shadow detail and soften the very bright background. I created a curves layer with a straight curve but with the fusion mode set to "Hard light". I reduced the opacity to about 50%. This increased the constrast and saturated the colours a little. I then masked out the effect of this layer from the trees because they had become too dark. I cropped the image because I didn't like the building and because I thought it suited a square format. I increased the saturation in the yellow to bring out that lovely light. It's a lot to write but quick to do. Total time about 5 mins. I thought I'd give it a go, and blow me, when I looked again I'd done almost the same as Tim. Straightened and cropped (I took a bit off the bottom as well), used Light Machine to adjust shadows and highlights, white-balanced on the van (warms things up a bit) and a touch of sharpening. I wasn't going to post it, but now it's done I may as well. The question is this: what's special about it to you? It is the sense of starting out on a journey, which I was experiencing when I first viewed the scene. I had come out of a part of the driveway which lay in a great tree's shadow. I was walking toward the sunrise. Although the sun had been above the horizon for almost an hour, the building across the street obscured it, due to the slightly southeast declination of the sun's path. I had a sort of tunnel vision toward that light at the far end of my street's horizon. Took a few steps, saw the stock-still rabbit in the lighter shade of the crabapple tree, raised the camera to my eye, and shot looking through the viewfinder at the rabbit. I had no idea that I was recording anything else. But it was the light which was my impetus as I began my walk down the driveway, before I saw the rabbit. After that, I moved slowly toward him, angling the camera down to frame him, and shot every few feet, 4 more times. In the last shot, he had leaped away before the G2 could finish registering him. What would you like to do to this image? Once you know where you want to take it, we'll be able to help you get there. I would like to keep and enhance that sense of being wrapped in an unpeopled, Edenic scene. But, as a sort of contrasting balance with reality, I still think I would like to keep the white van in the picture. A sort of universal image of "country in a city setting" being conveyed by that contrast. As I wrote elsewhere, as soon as I saw the rabbit, the last chapter of Kenneth Grahame's *The Wind in the Willows* came into my mind. Of course, in that story, IIRC, it is the toad who is the "piper at the gates of dawn." It's the gates of dawn--stepping out of the dimension where the white van is parked and into an alternate, fantasy-reality--that I would like to express. And the side-looking rabbit--one eye on me, one on the white dawnlight, is my piper. 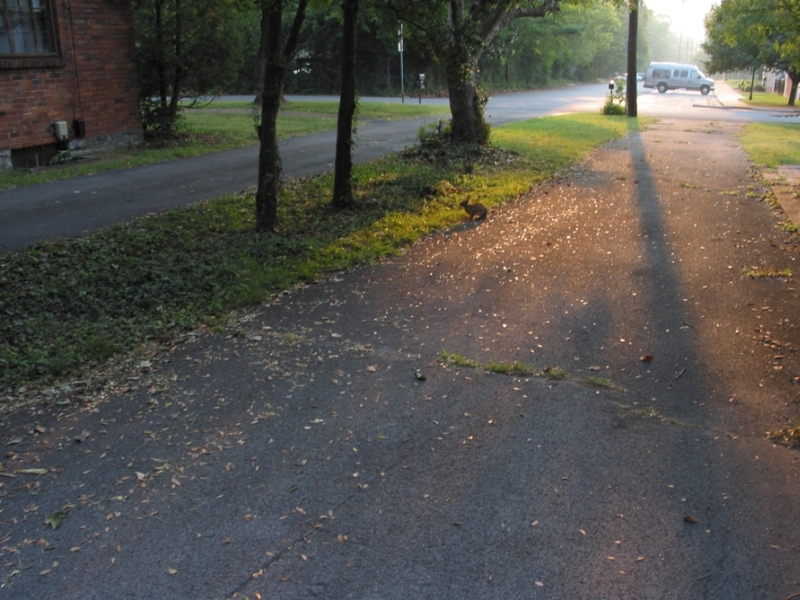 It's as if the light had fallen through a prism just before it touched the rabbit and the driveway beside him. That driveway is ordinary black asphalt. It's pink in the untouched RAW file. The sense of that hidden, golden sun, which has just risen, is enhanced if the driveway color is tuned a bit more to the red end of the spectrum. I like your take on this, Tim. I liked what Stuart Rae did as well. The slight rosy glow he put on the misty light at the end of the street (journey's end, in my mind) emphasizes my fantasy of "the gates of dawn." Lots of different interpretations are very much what I'd like to have. And thanks for having a go at it, Tim. 1. I don't have or know how to use Photoshop. I'm not sure that I can do "curves" or their equivalent in LightZone. 2. The house next door was the first thing that I cropped out when I was playing with the image myself. It's good to have the building on the opposite side of the screen gone, too. 3. I liked the blue color you gave to the van. 4. I liked the saturation amount and the color enhancement--the golden glow, and the reddened driveway. 5. I liked the square dimensions. Thank you so very much, Tim. And a good job it is, too, Stuart, from my point of view. All excellent things to do to the image, I think. I liked the slight crop at the bottom of the driveway. One of the things I tried myself, in an effort to emphasize the reddish hue. I'm glad you kept the van and warmed it up a bit. And as I said in the reply that I just posted to Tim, I liked the pink glow which you put on the misty light at the street's far horizon. I appreciate it very much, Stuart. It keeps the unworldly aura I saw in the picture when I first brought the RAW file up on my computer monitor's screen, while balancing it with an expression of my idea of the "countryside in the city." You mean send it to you as an e-mail attachment? I don't know how to do that through the forum. If I do it through the forum's e-mail facility, can I attach it? Alternatively, you could put your e-mail address in a PM to me through the forum, and I could then send you an e-mail using my own e-mail client, which I know will send the attachment. Please excuse me for not knowing what to do. I do have the TIFF CRW that went through Canon's RAW converter and emerged as a TIFF. Unfortunately--not knowing as much as I do now--I deleted the image from the CF. And I don't thinK the CRW and THM are still on the hard drive--if they are, I don't know where Windows XP has hidden it. So, if you could teach me a bit what to do to get you the file you'd like to work with? I'd be happy to send it. Brian, I don't know which part of Nik's post is cracking you up. I most certainly did not think anyone would want to sell this image. It's a learning exercise for me to put it here. And if Nik did want to enhance and sell it, I would say go for it--send me a PM about how the two of us could share the receipts. Actually, it's like with my amateur poetry. If someone wishes to disseminate it, I'm not going to waste any time in court over copyright issues. Just put my name on it--I am happy, happy to be read--or viewed. Brian, text is so hard to interpret, with no facial expressions to go along with it. So, would you like to explain yourself to me, the OP? Will do. And from now on I"m leaving anything I like on the CF until I learn to control where XP stores the CRW and the THM. I'll send you the TIFF that's in LightZone. Is it really necessary to zip it? I have WinRar that I could compress it with. I only mentioned zip since it's the archiver de facto in windows world. Nick, I have a problem. The CRW file (TIFF, in Light Zone) is 22.1 MB on the hard drive. After WinRar compressed it and attached it to my e-mail message, Comcast refused to send it because the message (with one line of body text only) measured 25.4 MB. I'm puzzled. I thought that after compression the file should be smaller. To double-check, I copied the WinRar file from the e-mail back to my Desktop and from there asked WinRar to extract it. It is indeed the file of my Challenge: Optimize This image. I have one other idea. A friend maintains a page for me on his website. I have SmartFTP. If I uploaded it there, and sent the address to you PM, perhaps you could get the file that way. Files bloat when attached to an email because of encoding to 7 bit. FTP is the way to go, or use sendit.com. I'm transferring it using yousendit as we speak. Don, the transfer completed just now. I'm going to post another reply to Nik and paste the number into it. Although, they said they would send the recipient an e-mail. I've just transferred it to w84u at mac.com using yousendit. They said it would be there for 7 days. P.S. I did this before I read Don's reply to me, and therefore uploaded the file at yousendit without compressing it in WinRar. I didn't know that e-mail added bloat to the file, and I thought maybe there was something wrong with my copy of WinRar when the compressed file measured 25.4 MB as an e-mail attachment. Nik's post gave me a little chuckle for some reason when I saw it, that's all. I will have to learn how to do that. So far, when I run them through the Canon ZoomBrowserEX, they disappear and a TIFF appears in LightZone. The RAW and THM files remain nowhere on the hard drive, that I can find. So I reason that they stay on the CF unless one has a program which allows one to save them to the HD. And of course, as I posted to you earlier, I had deleted the files from the CF, thinking it a good idea to keep it empty for further shots. However, the 1 GB card holds a lot of shots. So for the time being, I'm just going to leave files on the card. I'm going to buy another RAW converter, but first I need to research that--probably something other than ZoomBrowserEx will offer me an option to save the CRW and the THM files to HD. And cheers to you, too! 2. Set up a folder "Pics" [or whatever name you like] on your working file partition. 3. Ingest the files from your CF either via Windows XP's capabilities [normal copy and move or download from camera/card reader]. Personal recommendation: Get DownloaderPro from Chris Breeze. 5. Open those DNG directly in a capabale application, e.g. LightZone, BreezeBrowser, ACR, RAW Shooter. Any further questions I gladly answer. - RAW files have only one channel (greyscale), hence they are smaller than the 1:1-TIFF generated from them. - Compressing already compressed files rarely saves space, usually the files get bigger; JPEG are the best known case but certain TIFFs [ZIP] exhibit the same. Barry Pearson covers DNG extensively. Since I wasn't really awake when posting, I left out the URIs for BreezeSystems and Adobe, which are now in. I also added the Barry Pearson source and corrected a spelling mistake. I will do these things. You should simply be able to browse to the files in Windows Explorer (double click My Computer) and copy/drag and drop them into a folder on your hard drive. I myself use a unix shell script to do this (cygwin). In truth my script copies the files to my computer, renames the files, copies the files to a separate physical hard drive, and then moves the files to my Not Yet Viewed directory from which first pass review occurs. Here's my contribution. Suspicious van removed: illegal parking for sure. Telegraph poles, trees. sidewalk, road replaced. Left side of street more shadow. Shadows selected. Curve one copy to bring it out. Another to darken another blurred, mixed to taste. Main picture Curve and desat green. Merge layers and "Bob's your uncle!" Long after I stopped using ZoomBrowser to convert RAW files I still used it to download them. (W2K wasn't good with cameras and I didn't have a card reader at the time). I suspect that the RAW files never were on your hard disk, and that you are converting them direct from the camera by going straight to "Edit | Process RAW Images". What you need to do is to select "Acquire and Camera Settings", then select "Acquire Images", and in the Camera Window follow the instructions to download and save your images. Beware of using Windows explorer direct with your camera as it seems to only "see" image files and not RAW files when connected to a recognisable camera. Your best bet is to buy a card reader (very cheap) and use that with Windows. Much safer as well, since you won't have your camera balanced precariously on your desk at the end of a USB cable. Not really illegally parked. The church parking lot adjoins the little one-block connecting street, with no demarkation between the city right-of-way and the church property. The van belongs to the church. But it works well to remove it. Beautiful. You have certainly brought out the sense of "the gates of dawn" which is central to the vision and emotion that I wished the image to convey. You should simply be able to browse to the files in Windows Explorer (double click My Computer) and copy/drag and drop them into a folder on your hard drive. Thanks a mil for the input, Sean. I'm going to go with the software which Dierk recommended to me. The learning curve is still steep for me, but with the help of such good mentors, I'll get there. It is a joy to me to learn. That's what I suspect, also. WinXP SP2 has a pretty good search mechanism. I used it and turned up nothing. Good advice. And great minds in the same channel. I already have a Lexar card reader. Bought it the day my old card reader conked out and I took it over to Wolfe Camera for help. While there, I got the knowledgeable store clerk to teach me how to make the RAW settings at "P" on the G2. And I bought a 1 GB Lexar CF. I'm going to go with the software recommendations which Dierk gave to me in his post above in this thread. If I don't reply to posts any more for awhile, it will be because I am following the steps he gave me so clearly on how to get and implement Downloader from Chris Breeze and Adobe DNG Converter. Thanks a mil for all your help and support, both here at OPF and by PM e-mail. You've given me great tips, and, even more valuable to me, great encouragement.